Confederation of Indian Industry (CII) is organising KERALA IR SUMMIT 2019 with the theme “Ease of Doing Business through Harmonious Employment Relations” on 17 January 2019 at The Gateway Hotel, Kochi from 0930 Hrs to 1730 Hrs. 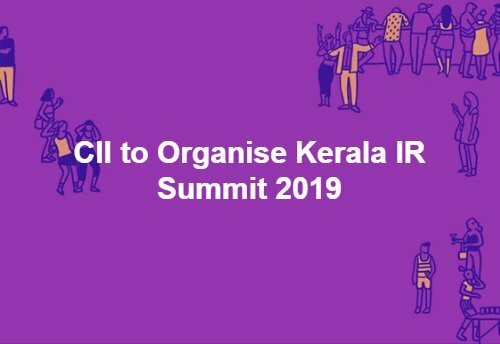 Kerala Industrial Relations Summit 2019 is designed to promote best practices in Industrial Relations by facilitating engagement between industrial relations and human resource professionals of various industries. The Summit will also provide key insights into the Kerala Work Culture and address the foremost challenges faced the HR& IR fraternity today. The objective of the Summit is to generate ideas for establishing a positive work culture and projecting the same to the outside world. This summit would serve as the common platform for HR & IR Professionals across the industry to share the best IR practices and learn from experiences and insights of highly successful corporates as to how they have shaped their IR strategy to meet not just the needs of the day, but also to prepare themselves for the upcoming challenges. The summit is to sensitize, discuss and debate on how HR & IR can work towards attracting, sustaining and developing the needed talent in line with their corporate strategies. The summit would look into strategically development of IR in the work force to manage situations under stress and crisis, initiate and manage change, build a sense of commitment, ownership and belongingness and meet the performance standards expected. Considering the diverse nature of Gen Y (Millennials) that is entering the Indian industry, a discussion on addressing the aspiration of Gen Y would also be held.